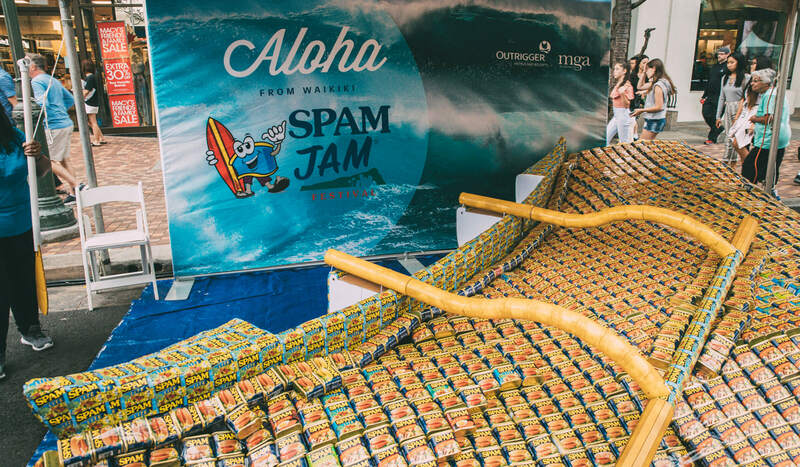 After more than a decade of hosting the SPAM JAM® festival, the island of Oahu’s yearly festival celebrating the canned meat, it’s safe to say she gets it. 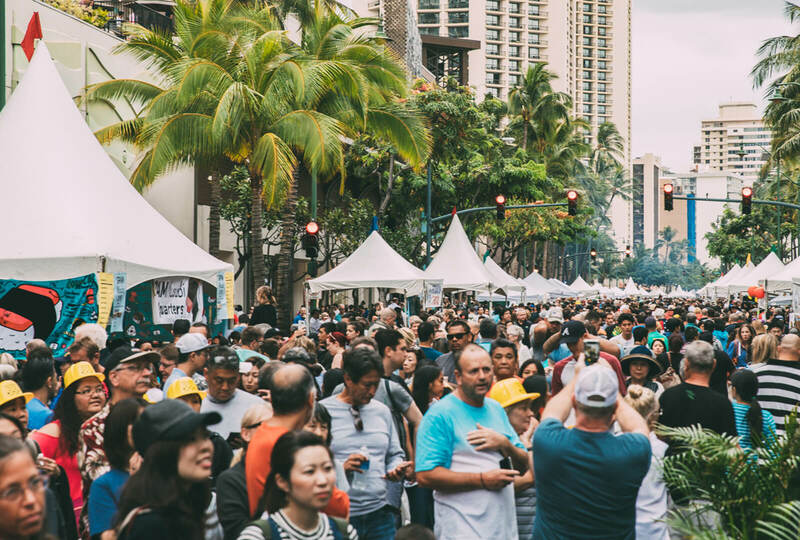 The SPAM JAM® festival takes place each spring on Kalakaua Avenue, a boutique-lined thoroughfare that runs parallel to the white sand beaches of Waikiki. The avenue’s shops offer a prince’s ransom of high-end goods and services, but on this weekend the scene changes. Sleek storefronts of European fashion houses give way to the smell of grilled onions and cooked pork. Barbara Campbell at this year’s SPAM Jam® festival. Donning a pair of SPAM® brand earrings, Campbell has been here since 7 a.m. with thousands of other locals, setting up sidewalk booths and preparing makeshift outdoor kitchens to feed the coming multitudes. By afternoon on the first day of the SPAM JAM® festival, 40,000 people crowd the street, waiting in long lines for different delicacies. The excitement is palpable. Dads hoist their kids onto shoulders and honeymooners spoon-feed each other SPAM® fried rice. A young woman with a flower in her hair slices pineapple. A woman sings Hawaiian songs on one of three huge stages that rise above the crowd, accompanied by a man on ukulele and a lissome young dancer who sways her way through a soulful hula. At the SPAM JAM® festival, the meat is mixed into everything from tacos to tater tots and served in French-style pastry. It’s used as a topping on pizza and candied in popsicles. 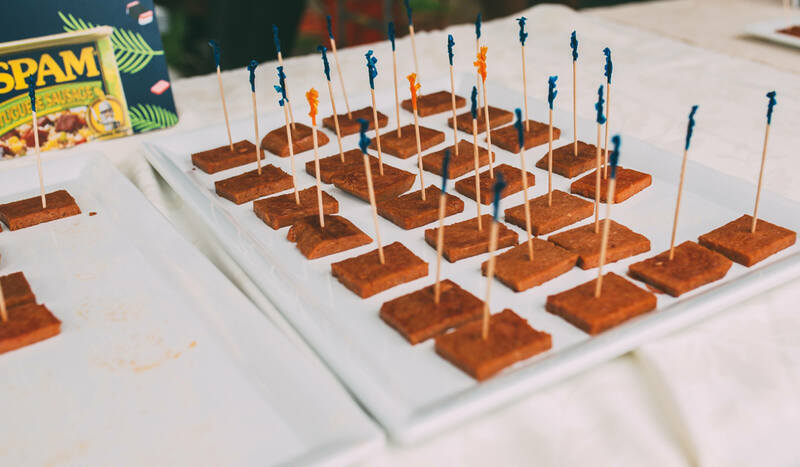 And it’s not uncommon of late to see SPAM® products featured in creative cuisine mashups at trendy restaurants in San Francisco and New York. But it started out as a food of necessity on the island, arriving on Oahu’s shores as a war ration, and it remains a bargain that many people can’t do without. The SPAM JAM® festival became a non-profit a few years ago and has since given over $250,000 and 35,000 pounds of food to the Hawaii Food Bank. 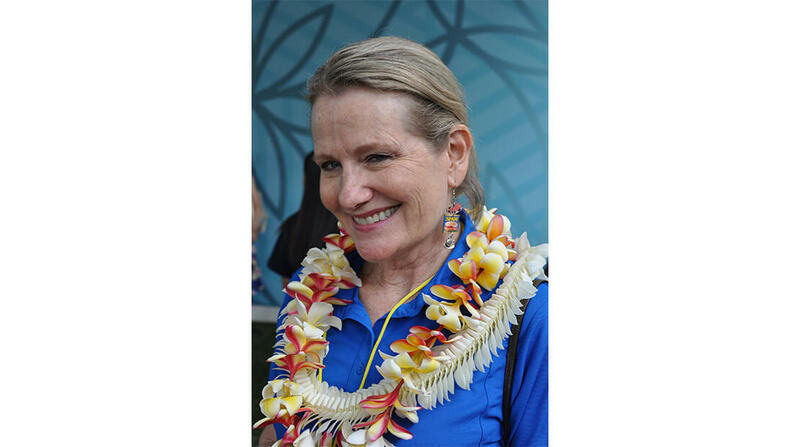 That’s just the way it is in Hawaii—everyone is “‘ohana,” or family, on the island. 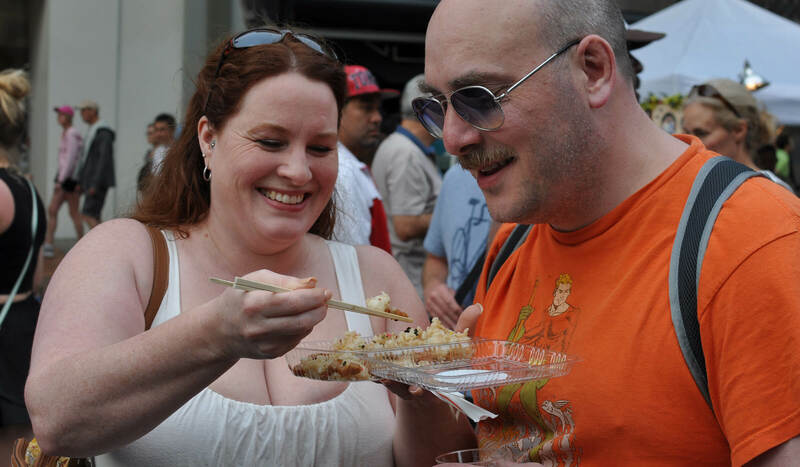 There couldn’t be a food festival without doing something to feed the hungry. “I grew up with it,” festival-goer Tino Villaro says. “I eat it at least once or twice a week.” Raised on Oahu, he notes that even McDonald’s serves a SPAM® breakfast—otherwise they wouldn’t be able to compete with local restaurants. 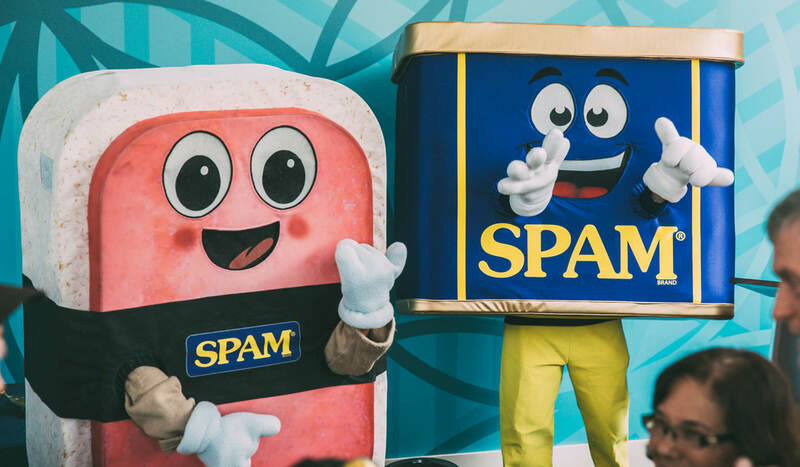 Villaro, like many islanders, feels a deep connection with SPAM® products. In fact, many think Hawaiians invented it and are surprised when they learn that SPAM® varieties are manufactured thousands of miles away, in Austin, Minnesota. This midwestern staple came to Hawaii in World War II, when soldiers needed protein and meat on the island was scarce. Lester Gamble was one of the Navy men who served on the island. He fell in love and decided to make a life in Hawaii after the war. Since there was no SPAM® products importer at the time, Gamble flew to the mainland, took a train to Austin, and asked Hormel Foods to let him distribute in Hawaii. They said yes. To say Gamble’s idea paid off would be an understatement. Today, Hawaiians are the greatest consumers of SPAM® products in the world per capita, eating 7 million cans of SPAM® brand a year. That’s five cans for every man, woman and child living in the islands. 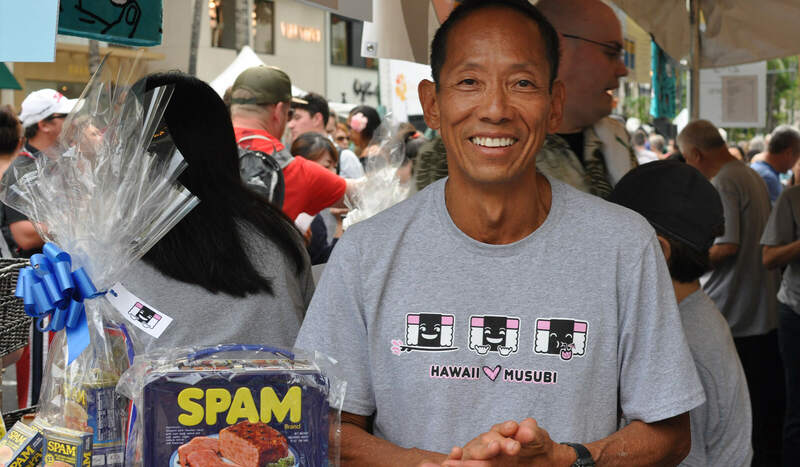 The throngs lining Kalakaua Avenue are testament to SPAM® brand’s ongoing popularity. I actually had SPAM® and eggs for breakfast this morning, as though I wasn’t going to get enough tonight. Many local restaurants have prepared inventive SPAM® dishes, high-brow mashups using the beloved value meat. But the most popular tents are devoted to an island standby: the humble SPAM® musubi. For the uninitiated, SPAM® musubi consists of a small hand-held patty of rice, topped with pan-fried SPAM® classic and wrapped in nori, the seaweed commonly used to strap layers of sushi together. An informal taste test suggests that the best ones are for sale at 7-Eleven, but you can get them at gas stations and supermarkets all over the island. Fifty years ago, plantation workers would pack them for easy hand-held lunches. Now, golfers bring them out to the resort links and surfers stash them next to the sunscreen and surf wax for a quick snack in between sets. As the sun goes down, people are still swarming the food tents and long lines stretch onto the street. Kids blow bubbles that float over the crowd and catch the slanting evening light that filters through the palm trees. Local YouTube sensations Honoka and Azita take the stage in flowered dresses to engage in a ferocious ukulele duel.